Grocery shopping is a part of life that cannot be avoided. We all need to eat, along with buying those other essential items needed for the household. Yet grocery shopping can be a time consuming and dreaded task for many. These days there is a great alternative available to many – online grocery shopping. You may be surprised exactly how many benefits of online grocery shopping there are. By staying home and ordering your groceries online, you are not only saving time driving to the nearest grocery store, but also searching for the items you need and waiting in line ups at check out. Saving time is definitely one of the biggest benefits of online grocery shopping. Shopping online means less temptation compared to shopping in store. If you are trying to eat healthy, doing it online can be a great way of sticking to your food plans and avoiding that naughty junk food aisle. Online grocery shopping is a huge help to anyone who meal plans. It is much easier to go through and ensure you have all the ingredients you need for each of the meals on your weekly meal plan when you can visualise your pantry, fridge and freezer in person. It also means less chance of forgotten ingredients because you left something off the grocery list. You can shop straight from your recipes. It’s easy to find specials online compared to in person sometimes, with all the specials listed by category or price and easily searchable. This can cut your grocery bill significantly. You can check your pantry for items instead of just guessing what you need and ending up with 3 bottles of tomato sauce and 5 bags of jasmine rice. This means less clutter in your pantry when you no longer end up with excess of certain products. You can wear whatever you like when you are doing your online shop, compared to turning up in store and being arrested because you are in your underwear. The only exception may be that you change before the delivery person turns up… if you so please. Sometimes we simply do not feel like seeing lots of people or that chance we may bump into someone we know, therefore another of the benefits of online grocery shopping is avoiding these opportunities by avoiding the grocery store. You can pick the time of the delivery, which can sometimes be before or after grocery stores open and close, giving you greater flexibility on when you get your groceries. Initially it takes us a little time to get the hang of online shopping, but soon you will be whizzing through and spending that extra time on something you would rather be doing. Or any other hobby you so please. Having the ability to do your online grocery shopping from a mobile device such as a phone or tablet means you could be doing it wherever you happen to be, during whatever you happen to be doing. While this may not be the case with all online grocery shopping, our chosen retailer charges based on weights online, and since that cannot be specific such as 500g rump steak, you end up with more rather than less so therefore more bang for your buck! If you haven’t tried it, it’s definitely time you found the benefits of online grocery shopping for yourself. I’m confused about how this would really be very practical? How do you get to choose your delivery time? WHERE are these on-line grocery sites that you’re shopping, please? I honestly don’t understand how this would work, but like the IDEA of it! Patricia, I am located in Australia & our 2 biggest grocery chains offer this service. I am surprised it’s not available in more countries though. It’s so convenient! Briliant! I laughed at the clothing point. 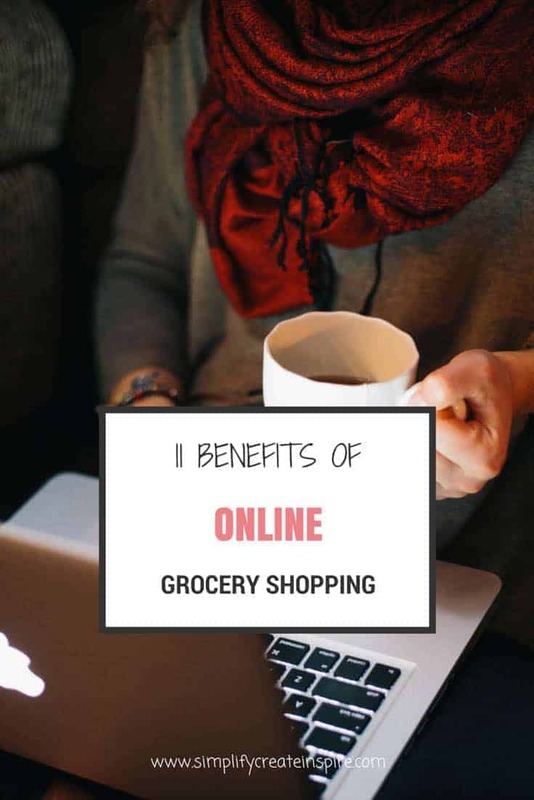 I love grocery shopping online as I tend to over spend by nearly double when I’m in store, so it’s a massive money and time saver to buy online. Me too. In store I end up grabbing every chocolate item on sale haha oops! Another benefit is that you can avoid those damn shopping centre ‘rides’ that my kids bug me to put money in every time!!! Hilarious that you should link up this post to #mummymondays…I have just finished a post called The Pros and Cons of Buying Groceries Online LOL! I love the clothes are optional one! I once had to very quickly get changed from my pj’s because your delivery arrived 20 mins early…at 6.40am!! !